Last week’s loss to Hayes left the Buckeye Valley football team with a bad taste in its mouth. Friday’s lopsided 37-6 non-league win over visiting Bexley, though, freshened things up a bit. And that’s exactly what the Barons (1-1) did. They started pretty well, too, as Trent Davies scored a pair of first-quarter touchdowns, one from 22 yards out and the other from the doorstep of the goal line, to give Buckeye Valley a 14-0 lead. Davies finished with 190 rushing yards and three touchdowns in the win. Quarterback Grant Owens got into the act early in the second, finding Tanner Hogg for a 45-yard scoring strike with 11:52 left in the second quarter. The Barons led 20-0 after failing to convert the two-point conversion … one of the few things they did wrong the entire night. The defense forced a safety when the snap sailed over the punter’s head on the ensuing possession and Owens hit Teren Wycoff for a nine-yard touchdown with 1:22 left in the half. Beau Ewing collected a short pass from Owens to convert the two-point conversion and give BV a 30-0 lead at the break. Davies capped his stellar night and the BV scoring summary with a 59-yard touchdown run with 10:08 left in the third quarter and the Barons cruised from there. Next up, BV will host Mount Vernon Friday night at 7 p.m. The Pacers had next to no luck moving the ball and stopping it, well, that didn’t go so well, either, as the Monarchs rolled to a non-league win Friday in Marysville. Hayes found itself down 14-0 after the first quarter and 21-0 at halftime. Marysville added a pair of third-quarter touchdowns to smooth out the scoring summary. Pacer quarterback Luke Jackson attempted just two passes, completing one for four yards. Blain McCormick led the way on the ground with 67 yards rushing. Hayes (1-1) returns to action Friday against visiting Westland. 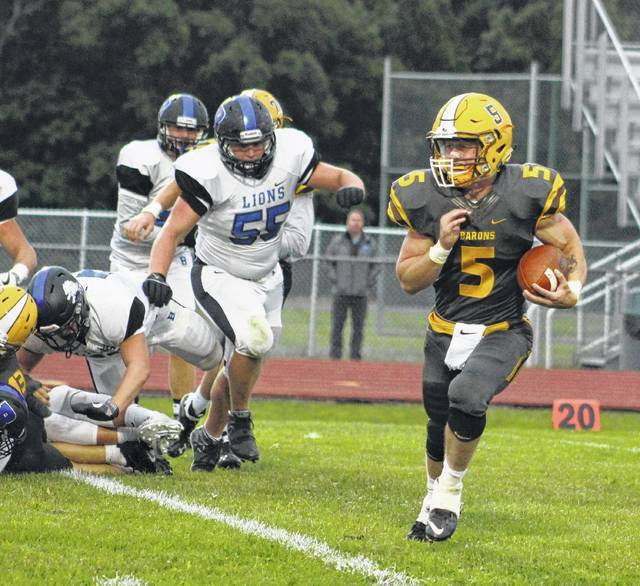 Golden Eagle running back Abe Myers powered into the end zone from a yard out to send the game into overtime, but Wolves QB Parker Wereb scored from 20-yards out in the extra session to send his team to a hard-fought non-league win Friday in Sunbury. Big Walnut (0-2) battled, tying the game on two separate occasions, but could never quite take the lead. Tyler Ronk found Nathan Lawyer for a 20-yard touchdown on screen pass, making it a 7-7 game midway through the second quarter. Things stayed that way until a 12-yard touchdown run from Elijah Young made it 14-7 Kilbourne with 2:02 left in the third. BW evened things up on Myers’ late-game TD, but couldn’t move the ball in the overtime period. Quarterback Luke Schmeling completed 11 of his 15 passes for 120 yards and a touchdown, ran for 48 more and the defense took care of the rest, pitching a shutout as the Pioneers blanked Watterson Friday night at Otterbein to move to 2-0. Graham Starn broke the scoring seal with a 15-yard TD run with 9:39 left in the first. He added a three-yard touchdown run later in the quarter to make it a 14-0 game. Orange scored again just before half as Schmeling found Jayden Rodgers from 11 yards out to make it a 20-0 game at the break. Brant Kightlinger and Jack Houston accounted for the only points of the second half, sacking Watterson quarterback Cole Andrews in the end zone for a safety. Ali Iverson, Jaden Konadu and Zack Slade ran for touchdowns as the Braves (2-0) handled host Grove City in non-league action Friday night. Buckeye Valley’s Trent Davies looks for running room during the first half of Friday’s non-league showdown against visiting Bexley.